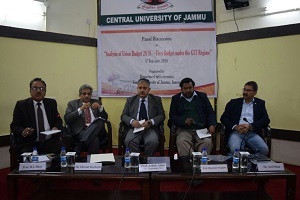 The Department of Economics, Central University of Jammu organized a Panel Discussion on “Analysis of Union Budget 2018-First Budget under the GST regime” on 5th Feb, 2018 at Temporary Academic Block, Sainik Colony, Jammu. The panelists in the discussion included Economist-Prof. Dipankar Sengupta, Businessman-Sh Vikrant Kuthialia and Journalist- Sh Anil Bhat. 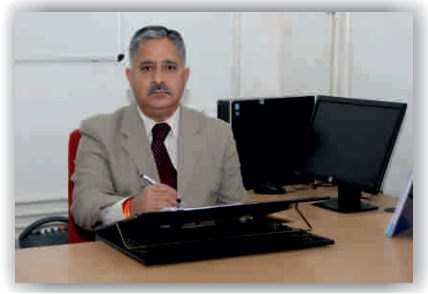 The discussion was conducted and moderated by Prof. R. L. Bhat, Professor of Economics, Central University of Jammu and the event was presided over by Prof. Ashok Aima, Vice Chancellor, Central University of Jammu. The panelist broadly agreed that the budget exercise was reasonably good given the various constraints which the finance minister had to work within. That the budget was a focused exercise with the clear cut emphasis on Rural Development, Infrastructural Development and Social Sector. However, the panelists were worried about the uncontrollable fiscal deficit, mounting oil prices and the problems faced by the middle class. It was noted that private investment was not picking up, export growth was sluggish and the farmers were in a state of distress. The three engines of growth viz exports, private investment and agriculture were not firing on all cylinders as was the case earlier on, when the economy was growing in the range of 8 to 9 %. As such, it was felt that there is not much in the budget for giving a push up to private investment and exports. The panelists agreed that while as the finance minister had an eye on some state assembly elections in the next few months and the Lok Sabha polls early next year, the budget was in no case an exercise in brazen populism. It was felt that the pressing problem of unemployment would be taken care of job creation by making heavy investment in rural and infrastructural development. After the panelists made their presentations, there was a question-answer session wherein the panelists responded to the various issues and concerns raised from the floor.